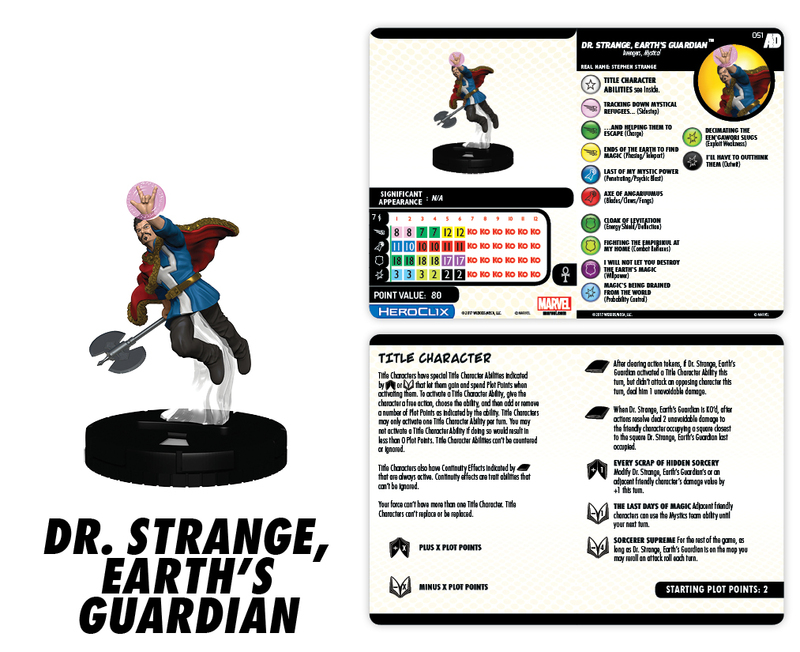 Welcome back as we continue our series of previews for our upcoming Marvel HeroClix: Avengers/Defenders War set! Today, we thicken the plot and give you the opportunity to tell the comic stories with the Title Character, Dr. Strange, Earth’s Guardian! Title Characters, as introduced in the Marvel HeroClix: Deadpool & X-Force set, are Super-Rare versions of iconic characters with a trait that gives them Title Character Abilities. Noted on the inside of their cards, these abilities unfold to reveal how these characters can build up to have a lasting impact on the game. Dr. Strange, Earth’s Guardian has two Continuity Effects that are always active and cannot be ignored and three Title Character Abilities that cannot be countered or ignored. Dr. Strange begins the game with 2 Plot Points, which, as a free action, you may spend or accrue once per turn to activate his Title Character Abilities. With Every Scrap Of Hidden Sorcery, you gain one Plot Point to modify the damage value of Dr. Strange or an adjacent friendly character by +1 for the turn. Dr. Strange, Earth’s Guardian can dissuade or punish the opponent for attacking his allies with The Last Days Of Magic, which lets you spend a single Plot Point to give all adjacent friendly characters the Mystics team ability until your next turn. If you can spend 4 Plot Points, you can get the greatest benefit of the Sorcerer Supreme and reroll any attack roll once each turn as long as Dr. Strange, Earth’s Guardian is on the map. Be careful to protect the good doctor and not to spend your Plot Points unwisely. You cannot spend Plot Points if doing so takes you below 0 points. As a result of his Continuity Effects, if you use a Title Character Ability but do not make an attack with Dr. Strange, Earth’s Guardian, he takes a click of unavoidable damage after the Clear Tokens step at the end of the turn. Furthermore, after actions resolve when he is KO’d, you must deal two unavoidable damage to the friendly character that was closest to the last square he occupied on the map. Now that we know how to use Dr. Strange, Earth’s Guardian as a Title Character, let’s look at his combat dial. This dial would be impressive even without the added Title Character Abilities, containing a power in every stat slot on every click, healthy combat values, and good damage options. At 80 points, he has the Avengers and Mystical keywords, the Mystics team ability, the Flight symbol, and can target a single character at 7 range. On this 6 click dial, he has three different power sets, each for two clicks that represent his spellcasting abilities and several of the magical relics in his possession. Maintaining a fair measure of mobility for his entire dial, Dr. Strange starts with Sidestep, Penetrating/Psychic Blast, Energy/Shield Deflection with an impressive 18 defense value, and Probability Control. Two clicks in, Dr. Strange, Earth’s Guardian unsheathes the Axe of Angaruumus to join the melee with Charge, Blades/Claws/Fangs, Combat Reflexes with the still mighty 18 defense value, and Exploit Weakness to pair with his already high damage dealing potential. If the opponent manages to get past that and onto his last two clicks, you can get Dr. Strange out of harm’s way with Phasing/Teleport and a 12-movement value. Conversely, keep him there to cut away at his foes maintaining Blades/Claws/Fangs, with the added benefits of Willpower, and Outwit. It took a lot of studying to become the Sorcerer Supreme. It won’t take that much to make it happen in HeroClix with Dr. Strange, Earth’s Guardian. Start off by getting him into a long-distance firing position to keep the opponent at bay so he can build up his Plot Points for a few turns with Every Scrap Of Hidden Sorcery until he can declare himself properly the Sorcerer Supreme and manipulate an attack roll to your advantage every turn. Then you can build your Plot Points back up and spend them to cause magical backlash on the opponent with The Last Days Of Magic ability handing out the Mystics team ability to Dr. Strange’s teammates. Thanks for reading! Join us again as we reveal more exciting characters and highlight strategies and team builds from the Marvel HeroClix: Avengers/Defenders War set and visit the WizKids Info Network to find upcoming Pre-Release Events near you! Until next time, keep your eyes peeled and your clix healed!